Kevin Junior was best known as the leader of The Chamber Strings and his association with the late brothers Epic Soundtracks and Nikki Sudden, both of Swell Maps fame. Kevin passed away in early 2016 at the age of 46. Flashes of brilliance marred by bouts with personal demons, Kevin Junior was an immense talent. 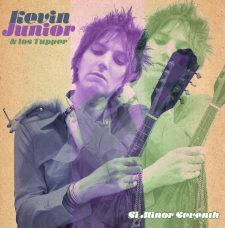 Si Minor Seventh was to be Kevin Junior’s return after a long period of musical inactivity. Recorded in 2015 in Spain w/ the band Los Tupper after a short tour, there was optimism that the EP would lead to good things. It wasn’t to be – Junior signed off on the cover art (it IS perfect) just two days before passing away. Los Tupper had detailed instructions about the final production flourishes needed and this stands as the final release from Kevin Junior. A posthumous EP that stands as his finest release (in my opinion). Big thanks to SunThunder Records for sending me a 7″ and CD version of this gem. It is a masterpiece. RIP Kevin Junior. This almost reminds me of a Stones song. I like it.